I’ve been a huge proponent of using foam board insulation to insulate basements, rim joists, and difficult locations like under bay windows. Recently we’ve been starting to install foam insulation board on the outside of houses for increased R value, decreased air infiltration, and better overall vapor management. ZIP System R Sheathing – This is a new product we’re using that incorporates ZIP Sheathing attached to foam insulation (the foam is under the sheathing). These two approaches are quite different in both how the foam is installed and also the orientation of the foam with respect to the framing and sheathing. Exterior Foam Board – This is probably the most common approach to exterior foam insulation. 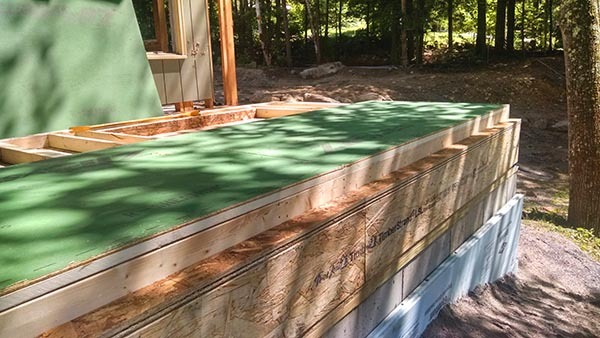 A layer of XPS or Polyiso foam board insulation is installed on top of the wall sheathing. We install the foam over a layer of house wrap using cap nails followed by taping all the seams with an approved foam insulation tape. This approach requires attention to details at doors and windows (usually some sort of buck to provide structural support for nailing flanges). This system can make siding installation a bit challenging due to crushing of the foam. ZIP System R Sheathing – We just finished a project (shown above) using the new ZIP System R Sheathing. This product is unique because the foam board is adhered to the back side of the wall sheathing in the factory. It’s available in two sizes, 1″ (1/2″ sheathing plus 1/2″ foam) – R3.6 or 1-1/2″ (1/2″ sheathing and 1″ foam) – R6.6. This product gets installed like traditional wall sheathing in one step (see wall framing below). This product is much easier to use when installing siding due to having the sheathing on the outside. Increased R Value – Having a continuous layer of insulation is far superior to just insulating within the stud cavities. This is due to the reduction in thermal bridging that occurs when the only insulation is cavity insulation. The result is a higher effective R value. 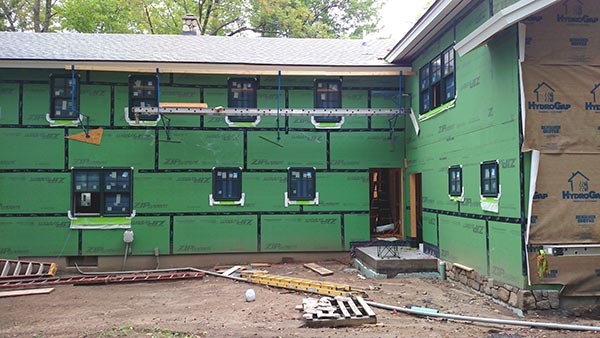 Renovation Work – The project we just used the ZIP System R Sheathing on was a renovation project where the existing home was framed with 2×4’s. Here in New England it’s nearly impossible to get a 2×4 wall to meet the Energy Code with traditional cavity insulation (spray foam would be one exception to this). 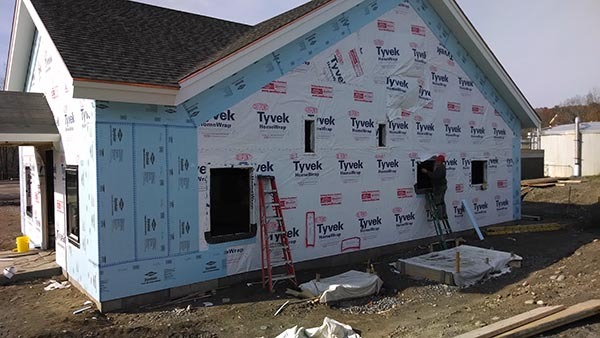 By using exterior foam insulation we were able to frame the addition with 2×4’s as well and provide sufficient insulation to meet the code requirements. Tighter Building Envelope – Installing a continuous layer of foam board and properly sealing the seams can drastically cut down on air infiltration and drafts. Cutting down on air infiltration can significantly improve the effective R value of insulation materials like fiberglass. Thinner Wall Profile – Another benefit is the ability to have a thinner wall section. In my most recent experience we were able to meet the energy code with a 2×4 framed wall. The Zip R seems like a winner. Are you concerned that in new england you are ending up with a vapor barrier on the “outside”. If you did zip r and fiberglass might you end up with condensation in the middle of the wall? Is some sort of fresh air exchange used? Otherwise it would seem you would need to do zip r and then spray foam, which would be pricey. Not really, you’re moving the dew point outside the fiberglass if you get sufficient foam on the exterior. Hello Todd: I’m really interested in using the Zip R sheathing on my future house build. I plan for using the 1.5 inch R sheathing. Quick question regarding it’s installation. Does the portion of the sheathing that is 1 inch foam actually “over hang” the outside of the rim joist and sill board instead of resting atop the floor sheathing or being flush with the outside perimeter of the rim joist and sill board? Have you had any issues with the zip system R sheathing since using it? Any information is greatly appreciated. Bryan – We installed it over the rim as well, typically we’d frame the wall, sheath it with a 1″ overhand down onto the rim, then add another piece after to the rim to finish it off. No issues at all, nice product! Most codes require a vapor barrier on the heated side of the wall. If you add this to the outside how are you not getting a double vapor barrier? I have seen the resulting mold from double vapor barriers in cold climates and it is not good. Because you’re moving the dew point outside the framing. I am a huge fan of SIPS. Best way to build and insulate at the same time as far as I’m concerned.